After 85 years of supplying Omega watch parts the Swatch Monopoly which controls Omega will no longer sell us or any other Independent Watch Parts Distributor in the World. The items on the site are the only items we can supply as the World's governing bodies and Courts have done little to stop the Swiss Watch Companies Restrictive Parts and Trade Practices. We invite all watch owners to voice their complaints directly to the Watch Companies as well as well as to Government agencies and officials. This is the long length version for those who have a large wrist. The long is an extra 3/4 of an inch longer then the regular. Total length of end with holes is 4 5/8" the other end is 4 1/4" overall length is about 8 3/4 inches. Has to used with the Omega deployment buckle OME-9452-1613. It's Rubber and Not Waterproof! The top is rubber and looks like leather, this stitched strap has a leather back and is not designed for wearing in water. Blue Rubber Strap 24 x 20 mm, takes a special 20 mm buckle number 94512022. Used on case numbers 166.077 & 166.0077. Spring bar OME-SPRING-BAR-25 is listed for this strap. Buckle number OME-9451-2022 is not included with the rubber strap. Black Rubber Strap 24 x 20 mm, takes a special 20 mm buckle number 94512022. Spring bar OME-SPRING-BAR-25 can be used for this strap. For model 2908.50.83, 2918.50.83, 2908.50.38. 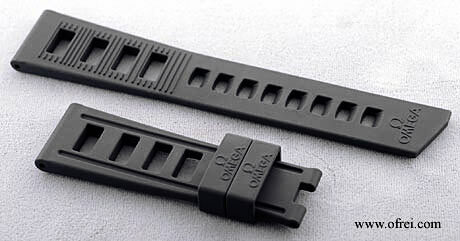 If you have metal bracelet 1579/951, 1581/953 or Alligator 98000148 you can use this rubber strap. Case numbers 178.1653, case numbers 168.1652 and 168.1650 take metal bracelet 1579/951. Spring bar OME-SPRING-BAR-24 is listed for this strap. This 22 mmm lug size strap takes the special Omega Deployment buckle OME-94521813 which is 18 mm at where the buckle meets the strap. Blue and White Rubber Divers Strap 18 mm lug size and 16 mm at Deployment Buckle end. 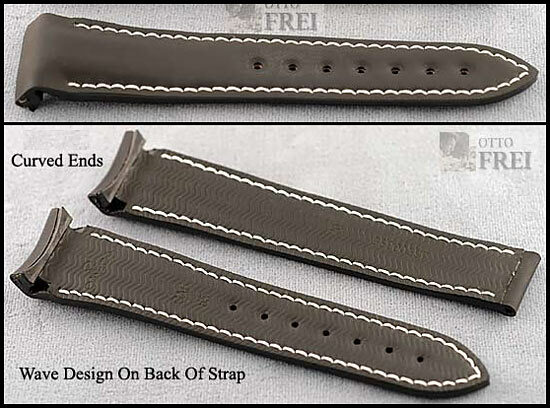 Total length of strap is 8 3/4" long. 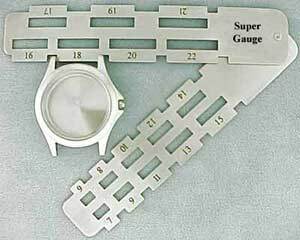 The part of the strap without holes is 4 1/4" long and the other part with holes is 4 1/2" and the 1st hole is 2 1/4" and last hole is 3 7/8" from watch lug. 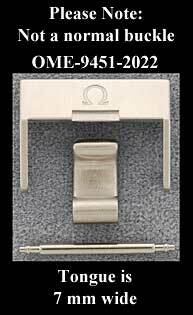 Takes the Omega 16 mm Deployment Buckle OME-9452-1613 or the short version of this clasp the OME-9452-1633. Black Rubber Divers Strap 22 x 18 mm, takes a special 18 mm Deployment buckle number 94521813. Used on model number 222.32.46.50.01.001 using case number 178.1654 and model number 2910.50.81 case number 178.1650, 178.1652. 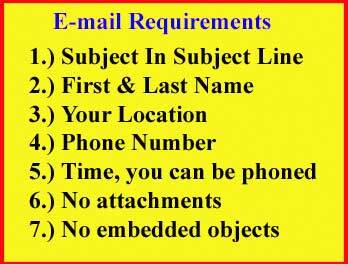 The 98000269 strap as well as the 98000196 strap and the metal bracelet OME-020ST1581953 (1581/953) have been used on the case numbers 178.1650 and 178.1652. This 22 mmm lug size strap takes the special Omega Deployment buckle OME-94522033 which is 20 mm at where the buckle meets the strap. If you have the Omega Stainless Steel Bracelet 1590/867 stamped one the clasp of your watch now, then this is the Orange rubber strap want. One of two loupes used on the Omega 98000144 and 98000145 Rubber Straps. Stamped with the word "Omega", closest to the buckle. One of two loupes used on the Omega 98000144 and 98000145 Rubber Straps. Stamped with the word "Seamaster", furthest from the buckle. One of two loupes used on the Omega 98000085 and 98000087 Rubber Straps. Stamped with the word "Seamaster", furthest from the buckle. 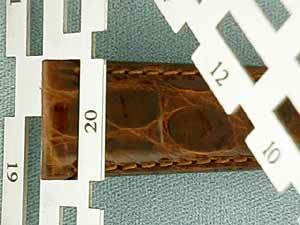 22 mm case lug, for 20 mm deployment clasp buckle. The Omega Metal bracelet that fits this model number is the 1591/831, so if that is the number you found stamped on your bracelets clasp then this is a strap that will fit your case. Deployment buckle does not come with the strap. You can use any of these 20 mm Omega Deployment buckles, Satin Finish Deployment Buckle 94522033, or the Omega Titanium 20 mm Deployment Buckle 94522019.